Optimize your desk space. Maximize productivity. Optimize your desk space and secure two monitors on a dual monitor arm . Pivot, tilt, swivel or adjust the height for an improved viewing comfort. 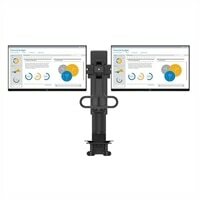 Dell Dual Monitor Bundle: U2417H without stand and MDA17Optimize your desk space. Maximize productivity. Optimize your desk space and secure two monitors on a dual monitor arm . Pivot, tilt, swivel or adjust the height for an improved viewing comfort. Optimize your desk space. Maximize productivity.